Come promesso, la lista dei minshuku ed hotel dove abbiamo pernottato. As promised, here is the list of minshukus and hotels where we slept. Day 1: Zentsuji city, Kaze-no-kuguru, 0877 63 6110. Nice place to stay, friendly and English speaking owner. Don't miss it! Though the owners do not speak English, they do their outmost best to communicate, and you will be able to do it, too. Very friendly. They can arrange dinner. After a long day, what's better than soaking into a hinoki scented ofuro? No English is spoken, but you won't need it. A place for surfers where also a Henro is welcome. Very friendly and caring owner, his smile will give you the most warming welcome. And he speaks English, too. Nice place with close by onsen. Possibility to have dinner, the kind landlady speaks English and can provide a lot of advices. Nice minshuku right in front of temple 33. No English is spoken. The owners speak very little English, nevertheless you will be able to enjoy some conversation and, even better, they make a delicious curry. Recently opened, it's not yet listed on the Henro book. Close to Matsuyama castle, it's a very nice place where you will feel at home. Landlady speaks good English. We found it calling at the number of the hotel and they redirected us there, since they were fully booked. Landlady speaks English, is really caring and the location is fantastic. It's not on the Henro route! Very nice place, very kind landlady with whom you will enjoy having conversations. She speaks a good English and can also arrange dinner or breakfast. Tradizionalmente il pellegrinaggio comincia a tempio 1 e finisce a tempio 88. Avendo noi cominciato a tempio 75 ed essendo in bicicletta, quindi mediamente più veloci dei pellegrini a piedi, abbiamo potuto osservare come l'aspetto del pellegrino cambi col progredire del cammino. A tempio 1 i volti sono rotondi, l'espressione quella di un bambino al primo giorno di scuola, tra henro ci si spiega come riempire l'osamefuda o su come recitare i sutra. Si percepisce la voglia di procedere velocemente oltre. Man mano che si procede il cammino cambia l'aspetto del pellegrino: il viso si fa più asciutto, lo sguardo più penetrante, i gesti più misurati, le parole più profonde e sempre più lontane dalla periferia delle cose. Ad un certo punto chiedere "a che punto sei?" diventa quasi superfluo, l'aspetto lo dichiara all'occhio allenato. Traditionally the pilgrimage is started at temple 1 and completed at temple 88. 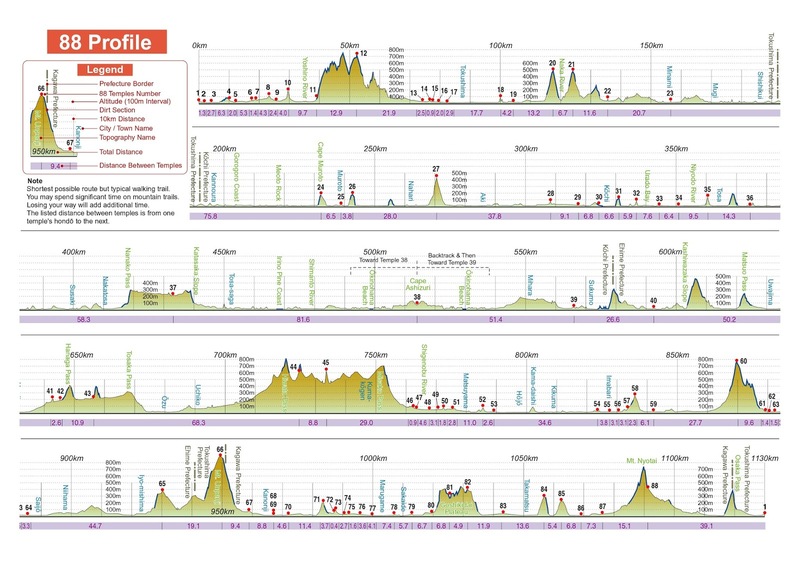 Since we started at temple 75 and, being on a bike, we were on average faster than walking pilgrims, we have had the possibility to observe the evolution of a pilgrim's appearance over the path. At temple 1 faces are round, the expression of a child at the first day of school, hints are exchanged on how to fill the osamefuda or on how to recit the sutras. One can feel the will to proceed further on. When the path procedes, the pilgrim's aspect change: faces get slimmer, the look more penetrating, gestures more contained, words and concepts become deeper and further away from the periphery of things. At a certain point asking "at which point are you?" becomes almost unnecessary to a trained eye, as the physical aspect speaks loudly enough. 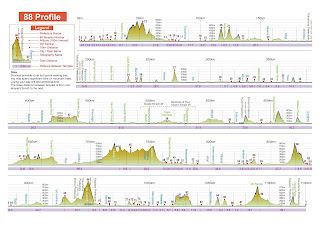 E con questi numeri siamo ritornati oggi a Zentsuji, tempio 75, chiudendo il giro cominciato 18 giorni fa. All'arrivo nessuna fanfara, nessuna miss ad aspettarci, solo altri pellegrini occupati nel loro pellegrinaggio e altra gente indaffarata nella propria vita. Ma comunque la nostra soddisfazione é stata grande, per essere riusciti a completare il primo giro dell'Henro Shikoku. Stamattina i saluti con la signora del minshuku sono stati molto toccanti e accompagnati da scambio reciproco di osettai. Noi abbiamo ricevuto la casacca da henro, e l'abbiamo orgogliosamente indossata tutta il giorno. Lungo la strada inoltre abbiamo ricevuto altri osettai, oltre che scambiato sorrisi e parole con altri henro. Dopo aver rivisitato tempio 75 siamo anche ritornati al minshuku dove abbiamo dormito la prima notte, chiudendo idealmente il cerchio, salutato il proprietario ed anche ripreso le sacche per il trasporto delle nostre bici. Nei prossimi giorni pubblicheremo anche la lista dei posti dove abbiamo dormito. Ora prepariamo i bagagli e poi meritato riposo. With these numbers we have reached today Zentsuji, temple 75, and closed the loop started 18 days ago. At our arrival no celebration and no trumpets, only henroes busy with their pilgrimage and other people buay with their own life, nevertheless our satisfaction is greay for having completed our first Henro Shikoku. This morning the greetings with the lady from the minshuku where we slept last night have been particularly touching, and we mutually exchanged osettai. We received the henro jacket which we proudly wore until the end of the day. Also along the way we received other osettai, together with the usual exchange of greetings and smiles. After visiting temple 75 we also went to the first minshuku were we spent the first night, to ideally close the loop, greet the owner and take back the bags for carrying our bikes. In the coming days we will publish the list of places where we have slept. Now we prepare our bags and then have some well deserved rest. Oggi abbiamo inizialmente percorso a ritroso il Shimanami-kaido e poi da li abbiamo proseguito fino a Niihama. Per tutto il tragitto il vento ha soffiato contro di noi, e su un ponte alto sul mare vi lascio immaginare quanto può essere forte, ed un sole decisamente caldo ci ha fatto sentire come può essere l'estate da queste parti. Una casa arredata con antichità collegate agli henro ci ha accolto per la notte, e la proprietaria ha apprezzato i nostri complimenti per la casa, e dopo cena è stato piacevole fermarsi a scambiare qualche parola con lei. Questo è forse uno degli aspetti peculiari di questo pellegrinaggio: chi mette a disposizione la sua casa per i pellegrini, pur chiedendo un simbolico contributo, non lo fa per profitto, ma per essere parte del grande scambio di energia ed esperienze veicolate da questo cammino. Un hotel, per quanto chic ed alla moda, sarà sempre freddo ed impersonale a confronto. Per questa ragione la prossima volta che faremo questo pellegrinaggio ci sforzeremo di imparare un po di giapponese, per meglio comunicare con le persone del posto. Today we went the other way around on the Shimanami-kaido and from there we reached Niihama. All along the route we had a strong head wind, and you can imagine how strong can the wind blow on a bridge high above the sea, and a strong sun shining on us has given a taste of how summer can be here. For the night we are staying in a house decorated with several antiquities related to henroes, and the owner has appreaciated our compliments for the house, and after dinner it has been nice to have some small talk with her. This is probably one of the peculiar aspects of this pilgrimage: those who give their house for hosting henroes, though asking a small fee, do not do it for monetary profit, but to take part to the big exchange of energy and experiences of the walk. An hotel, no matter how cool and modern, will always result cold and impersonal in comparison. For this reason yhe next time we will do this walk we will try to learn some japanese, to better interact with the locals. "Una bicicletta è amica in un modo in cui un'automobile non potrà mai essere. Un'auto può essere un'amante: sofisticata, complessa, dotata di temperamento, ma un passo falso e la storia è finita. La bicicletta è semplice, non chiede nulla, è fedele, ma come ogni amico ci puoi lavorare sopra, puoi conservarla, ripararlo quando è necessario, passare del tempo con lei, arrivare a conoscere il suo carattere. Io ero arrivato ad amare questa mountain bike Dirty Wolf verde e rossa. Siamo partiti come estranei, appena presentati l'uno all'altra al terminal ferry di Osaka; ma attraverso tante reciproche incomprensioni - muscoli stirati, catene uscite di posto, gomiti sbucciati, ruote ammaccate - abbiamo stabilito un rapporto. [...] Il piacere di avere tra le cosce un mezzo buono, che risponde al tuo tocco e alle tue necessità, è una gioia che non ha paragoni." "A bicycle is a friend in a way that a car can never be. A car can be a lover: sophisticated, complex, temperamental, but one misstep and the story is over. The bicycle is simple, doesn't ask for anything, it is faithful, but as every friend you can work on it, you can keep it, repair it when necessary, spend time with her, get to know its character. I had come to love this green and red Dirty Wolf mountain bike. We started out as complete strangers, just introduced to each other at the ferry terminal in Osaka; but through many mutual misunderstandings - strained muscles, jumped chains, peeled elbows, dented wheels - we have established a relationship. [...] The pleasure of having between my thighs a good vehicle, which responds to my touch and my needs, it's an unmatched joy." Per intraprendere un viaggio così lungo, in una terra che per quanto cordiale è pur sempre straniera, ovviamente non basta leggere un racconto cyberpunk. 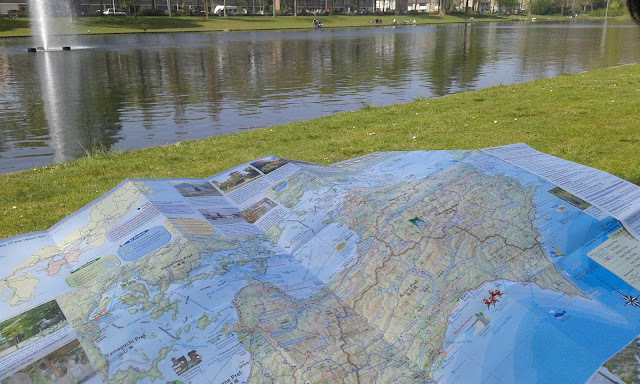 Occorre prepararsi raccogliendo mappe e altre informazioni utili. Dopo qualche ricerca in rete abbiamo trovato diversi siti che offrivano tante informazioni; tra questi ne abbiamo usati due in particolare. Il primo (Shikoku Henro Trail) ci ha indirizzato, tra l'altro, verso un libro che è una vera è propria miniera di informazioni, contenente tutte le mappe per l'itinerario a piedi. (si potrà chiamarla Bibbia del pellegrino se il pellegrinaggio è Buddista?). 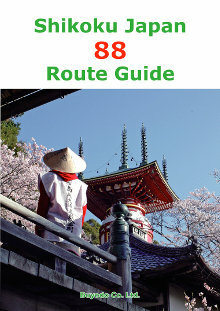 Si tratta dello Shikoku Japan 88 Route Guide, disponibile in inglese ed anche in giapponese. Si può comprare on line dal sito, oppure se vi trovate a passare da Amsterdam si trova in vendita da Pied à Terre. Collegato al sito trovate anche un forum dove trovare risposte a tutte le domande che potreste avere. Non soddisfatti di questo, abbiamo provato a consultare anche la JNTO (Japan National Tourist Organization), chiedendo loro se per caso sapevano indicarci come trovare delle mappe dettagliate dello Shikoku. Beh, forse non ci crederete, ma ce le hanno spedite a casa, in abbondanza. E, fatto non trascurabile, in doppia lingua, perchè se volete chiedere informazioni alla gente del posto, ma la gente del posto non sa leggere i caratteri occidentali ma solo i kanji, la vostra bella mappa in caratteri latini è inutile come una forchetta per mangiare una zuppa. Ovviamente in rete non mancano video che vi danno informazioni sul pellegrinaggio, e tra questi ci è molto piaciuto un documentario fatto da Ingmar Beldman, uno steward olandese che ha fatto il pellegrinaggio nel 2013 e che ha tenuto un diario video del suo cammino. Sono 20 filmati da 15 minuti l'uno, che coprono tutti i 46 giorni di cammino. Mentre sostava in un minshuku, Ingmar si è trovato a scambiare quattro chiacchiere con un simpatico vecchietto giapponese, che gli ha detto di avere 71 anni e di aver completato il pellegrinaggio già 21 volte, come testimoniato dal suo libretto pieno zeppo di timbri dei templi. La cosa divertente è che questo vecchietto affermava di completare un giro (1200 km) in 20 giorni, cioè viaggiando alla media di 60 km al giorno. la preparazione continua e pensiamo, o almeno speriamo, che alcuni di voi non sappiano molto di questo pellegrinaggio nello Shikoku e siano curiosi di saperne di più. Eccoci quindi a darvi alcune informazioni. 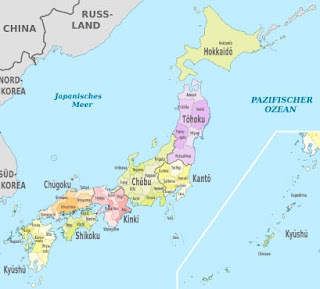 Lo Shikoku è la più piccola della isole maggiori dell'arcipelago giapponese, e si trova nella sua parte meridionale. Le città più note nelle sue vicinanze sono Osaka e Hiroshima. Lo Shikoku è ancora un'area prettamente rurale, con poche città ed un ambiente quasi originario, quindi dimenticate i luoghi futuristici e tecnologici di Tokyo, qui è un altro pianeta. Sull'isola ci sono, tra gli altri, 88 templi che compongono il percorso del pellegrinaggio. Come potete vedere dalla mappa, lo Shikoku è lungi dall'essere un'isola piatta, e ci sono interessanti (per il pellegrino 1) o spaventosi (secondo il pellegrino 2) sali e scendi lungo la strada. Potete anche vedere il profilo altimetrico del percorso che si affronta a piedi, che attraversando monti e valli a volte non offre strade asfaltate al pellegrino. Non c'è un ordine prestabilito per completare il pellegrinaggio, in principio lo si può fare in senso orario o antiorario, oppure visitando i templi in ordine sparso a seconda della convenienza. Ci sono ad esempio pellegrini che completano il pellegrinaggio poco alla volta, camminando nel fine settimana o quando hanno tempo. Il modo usuale di percorrerlo è cominciando a tempio 1 e ritornarvi camminando in senso orario fino a tempio 88. Narra la leggenda che un ricco mercante di nome Emon Saburo, dal cuore indurito dalla troppa ricchezza, abbia rifiutato a Kobo Daishi la carità di un pesce secco. Poco dopo venne colpito da una malattia, e riconoscendo il suo errore cominciò a seguire il pellegrinaggio con la speranza di incontrare il Daishi ed implorare il suo perdono. Dopo aver completato il percorso venti volte in senso orario e non avendolo mai incontrato, pensò che forse camminando in senso antiorario avrebbe finito per incontrarlo. Stremato dalla fatica si ammalò e, mentre era prossimo a morire, il Daishi gli apparve e gli concesse il suo perdono. Il mercante allora chiese di poter rinascere in una ricca famiglia per poter fare del bene, e morendo afferrò un sasso. Dopo nove mesi, nella città del mercante, nacque un bambino con la mano chiusa a pugno, che nessuno riusciva ad aprire. Venne chiamato un prete dal tempio vicino per investigare, e dopo aver invocato il Daishi il bambino aprì la mano, mostrando che vi stringeva una pietra su cui era scritto "Emon Saburo rinato". Dicono che un viaggio di mille miglia cominci con un solo passo: il primo. Ed il nostro è effettivamente un viaggio di mille miglia.. e per fare il primo passo ci dobbiamo preparare. Ma come? Cominciamo dai nostri fidi destrieri, le nostre biciclette che ci porteranno in giro per lo Shikoku. Fargli fare una revisione completa, dato che dopo 8 anni di utilizzo ne avevano tutto il diritto. Catene e pignoni nuovi, cavi ingrassati, pneumatici nuovi. In più montato anche un gruppo luce posteriore ed i pedali con attacchi rapidi. Organizzarsi per trasportarle e farle arrivare integre a destinazione. Per il trasporto in aereo le imballeremo in scatole di cartone, ma per il trasporto in loco dobbiamo obbedire alle specifiche dei trasporti pubblici che prescrivono il trasporto in sacca più altri vincoli, ossia, per il bus volume max 0,25 metri cubi, mentre per il treno somma delle tre dimensioni inferiore a 2,50 metri. Dovendo poi portare la sacca appresso durante il viaggio ne abbiamo cercata una che fosse robusta, leggera e non costasse uno sproposito. 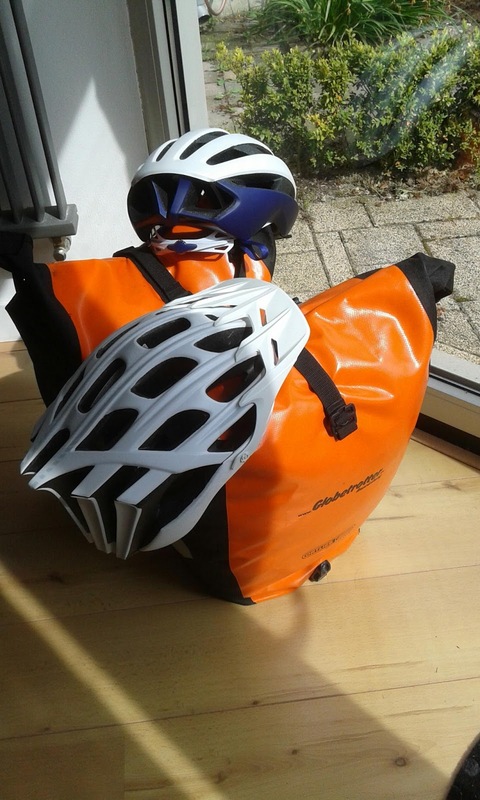 Abbiamo trovato una sacca da 2,3 kg che non è fatta di carta velina ad un prezzo ragionevole (Vaude big bike bag, per chi fosse interessato). Prepare le biciclette per trasportare i nostri pochi bagagli, dotandole, oltre alle sacche impermeabili che già abbiamo anche della borsa da manubrio. Per quel che riguarda la pianificazione del tragitto, avevamo pensato di partire da tempio 1, ma una verifica dei tempi di trasporto ci ha fatto concludere che partire da tempio 75 ci avrebbe permesso di guadagnare un giorno. Infatti dall'aeroporto saremmo arrivati a tempio 1 a pomeriggio inoltrato, quindi avremmo passato un giorno praticamente fermi. Invece andando a tempio 75 riusciremo a visitare 2 templi e a preparare le biciclette per l'indomani. Tra meno di 2 mesi saremo li... non vediamo l'ora!